It is startling how much money I used to just throw away by letting meats, cheeses, breads, and produce go bad in my refrigerator. I would have such good intentions for cooking at home, but somehow I would routinely end up with a $100 dollar grocery bill and nothing to show for it but a packed trash bag. I have challenged myself to not only throw away less food this year by being more creative with my shopping and menu planning, but to also minimize the occasional tupperware “science project” that used to show up in the back of my fridge a little too often. I started out this week’s menu with shrimp & andouille creole over white long-grain rice. Our eyes were bigger than our stomachs that night, so we had quite a bit of rice left over. The next day I started thinking about how I could use up the rest of the rice. In no time I had my heart set on recreating the Arancini that I used to order from one of my favorite bistros. I just knew the rice, which we had seasoned with garlic, onion, salt, and pepper would work perfectly! 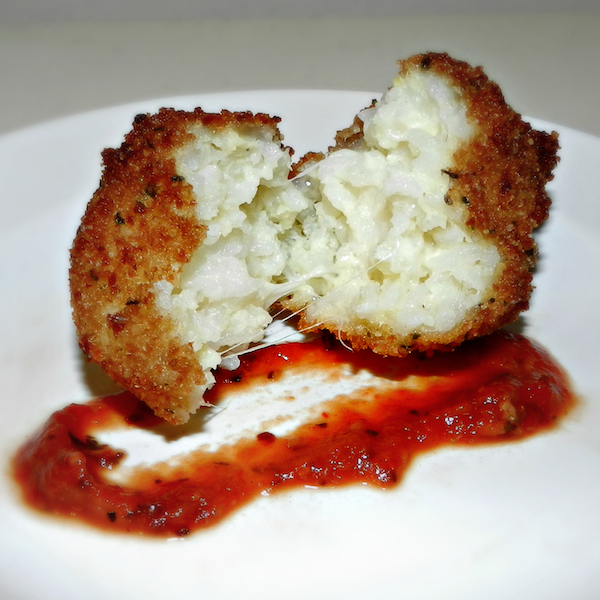 Arancini is a traditional Italian rice ball dish. I have seen it used as a main course and also as a starter or side dish. I just love the crispy texture of the seasoned breadcrumbs paired with the gooey cheese on the inside. Served warm on the table with a side of marinara for dipping, I knew arancini would be a tasty side for our tortellini. To make the arancini begin by filling a heavy-bottomed pot over medium heat and add enough oil to rise 3-4 inches in the pot. Combine the rice, parmesan, mozzarella, and one egg into a mixing bowl and combine thoroughly with your hands. Form each arancini by taking a small portion of the mixture and squeezing it firmly into a ball. Set the arancini aside on a piece of wax or parchment paper. Repeat the process until all of your arancini are formed. Next, whisk together the remaining two eggs. Dip each arancini into the egg and then roll it into the breadcrumbs, shaking off any excess. When the oil reached 375 degrees, add 2 or 3 aracini into the pot. Fry them until golden brown and heated through. Use a slotted spoon to remove the arancini from the pot and place them on a plate lined with paper towels to soak up any extra oil. Repeat the process for all of the arancini. Arancini is a great dish to keep in mind when you feel like taking a different spin on a rice side dish. There are so many ways that you can adapt this recipe for different flavors and fillings. Next time I think I will add some fresh basil and crushed red peppers to give it a little bite. Yum! Hi Rachael! I used long grain white rice for this recipe. Thanks for reading! Could you tell me how many your recipe made? I am going to try it for a large group and just want to make sure I know how much to increase the ingredients. Thank you! Is there an option to bake them? Hi Leah, I have not tried baking them myself, but here is what I would try: Preheat your oven to 425 degrees F and spray a rimmed baking sheet with olive oil cooking spray. Make your arancini and transfer them to the baking sheet, coating each side with additional olive oil spray. Bake for about 25 minutes. Thanks for posting, I have made these years ago. My mother in law gave me the recipe, with that recipe it calls for making a chop meat, peas and tomato sauce mixture and place that in the middle of the rice ball. It also took forever to make. Yours sounds a lot easier. Will be giving it a try.